To learn more about how consumers will interact with autonomous technology, automakers are working with popular pizza chains. The first time the US combined food and cars, it was 1921: That’s when the Pig Stand, the first drive-in restaurant, was born in Texas. Nearly 100 years later, automakers have led the charge to change how we get our food. Toyota and Pizza Hut announced a partnership at the beginning of 2018 at the Consumer Electronics Show (CES), showcasing a concept vehicle to bring pizza to customers with autonomous technology. It would be in charge of making the pizzas en route to a delivery and driving itself–and may be on the roads as soon as 2020. Toyota isn’t the only automaker using pizza delivery as a gateway to build its autonomous car tech. Ford also turned to pizza–this time, Domino’s. The pizza company made news this summer when it paved potholes around the country to protect its pizzas from getting jostled. The two teamed up to look closer at how consumers would behave with a self-driving vehicle. 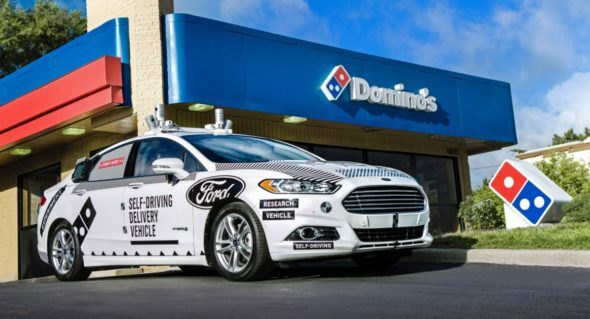 Domino’s partnership with Ford started with a limited pilot run in Ann Arbor, MI, using an autonomous Ford Fusion. (An engineer was also behind the wheel for safety’s sake.) Instead of the typical red, insulated bag keeping these pizzas toasty, Ford transformed the car’s backseat into a keep-warm compartment. When users approached the vehicle, they would punch in a unique code on a keypad mounted next to the compartment to unlock it and access their pizzas. Pretty neat, right? Domino’s anticipates putting more of these vehicles on the road for 2021. We may not be at the level of self-driving pizza vehicles yet, but cars like the Ford Fusion have extensive driver-assistance technology. Search for new or used Fusions and filter your search. The Domino’s–Ford partnership is the second time the pizza chain teamed up with an automaker. In 2015, Domino’s worked with Chevrolet to create the DXP, a vehicle designed for transporting pizza based on the Chevy Spark. (Autonomous tech was not the focus for this venture, just delivering an excellent pizza experience.) These vehicles could hold 80 pizzas and had special compartments for 2-liter sodas and non-pizza-box-shaped foods like salads and wings. Cars of the Future: Fact or Fiction? This entry was posted in Car Industry News, CarGurus Features and Updates, Cars Coming Soon, New Cars, Trucks & SUVs, United States, Used Cars and tagged Dominos Chevrolet, Dominos Ford, Pizza Hut Toyota, SEMA, Tundra PIE Pro. Bookmark the permalink.